The design pattern of the masonry WordPress themes is very popular amongst bloggers and photography experts. It’s clean and well-structured layout will allow you to show off your work in an extremely elegant way. All the themes are very magnificent and come with retina ready layouts which gives your visitor an eye-pleasing experience. Grid layouts are very popular amongst the designers, even a non-techy person can portray it in numerous unique ways. Most of all the themes are fully responsive, compatible with plugin integration, and cross-browser compatible. One of the fringe benefits of using masonry WordPress theme is that it makes your site clutter free and well-organized. Here we present a complete roundup of top 5 premium masonry WordPress themes. 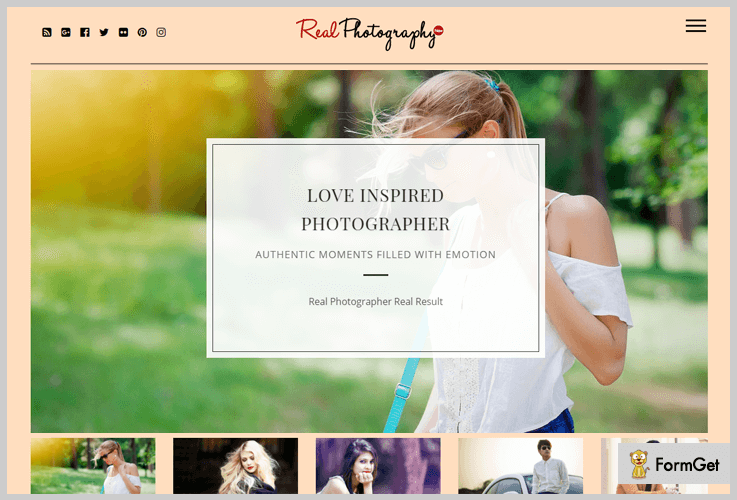 Real Photography is a classic WordPress theme to show and sell your creativity in the web space. It is a premium product of InkThemes.com with custom InkOption Framework embedded within. The advanced feature of this theme is that it has four different layouts to show gallery pictures in the blog section. The theme has a magnificent boxed slider region to display pictures in a moving effect. The Real Photography masonry WordPress themes have a developer license of $59 with custom templates and 30 days money back guarantee. 4 different portfolio blog design to show beautiful images in masonry grid style. Custom menu style and different social icons available in the header. Unique functionality to add and share Instagram profiles. 10 amazing skin color options provide your website a great look. 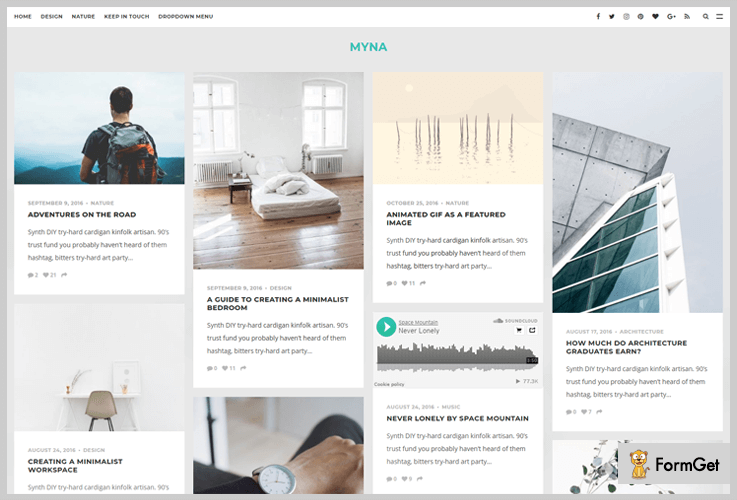 Myna is a minimal and fully responsive masonry WordPress theme. It is a type of content focused design, usually designed for bloggers point. The tremendous features will help your blog to stand out from the others. The content focused design will help your reader read without any distractions. This theme supports 5 different post formats namely audio, video, gallery, quote & link. The Myna masonry WordPress themes have a regular license of $49 and 6 months complete support. The theme has an off-canvas menu option available for the sidebar area. You could choose animated GIF as content featured image. The theme has a full-width media feed section for Instagram, Dribble or 500px. This theme has a social bar embedded within the layout for various social sharing icons such as – Facebook, Twitter, Instagram, Pinterest etc. 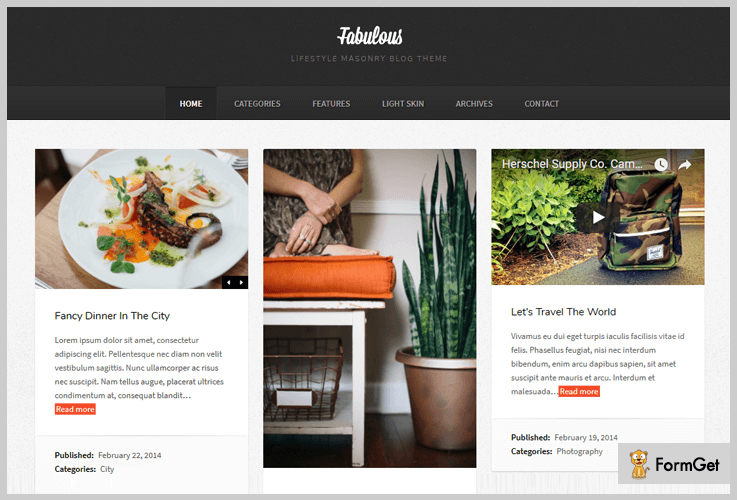 Fabulous is a modern masonry WordPress theme. It has a classic style that always remains in the latest web fashion trend. This is a theme designed for standard, gallery, audio, video, status and quote posts/blogs. Moreover, this theme follows both left as well as right sidebar page layouts. Now, this template is perfect for bloggers, designers, photographers etc. Buy the 4.5 starts rated Fabulous masonry WordPress theme at just $39 only. This theme will provide 1-4 column grid layout. It is available in both light and dark skins. Advanced functionalities of pagination and infinite scrolling. An archive page template for your blog feeds. 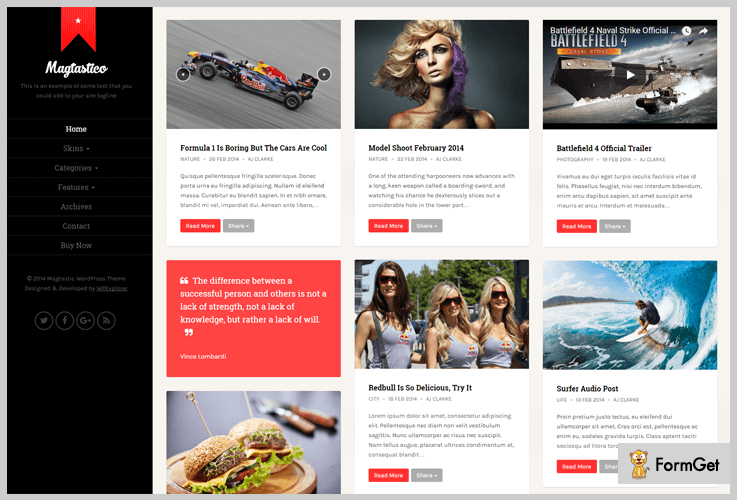 The Magtastico is a perfect masonry WordPress theme for bloggers. This theme features a full-width masonry style design layout along with a left sidebar and unlimited scrolls. The theme sidebar contains the logo, menu, and the copyright content. Additionally, the theme has built-in social sharing icons that will help you in gaining a social presence for your business. Get this theme at an affordable pricing plan of $39 only. Support all custom post formats image, audio, video, gallery, and quote. 6 different styles skins and color pickers. This theme support threaded comment for your blogs/posts. It is customizable in simple clicks with the powerful theme customizer. 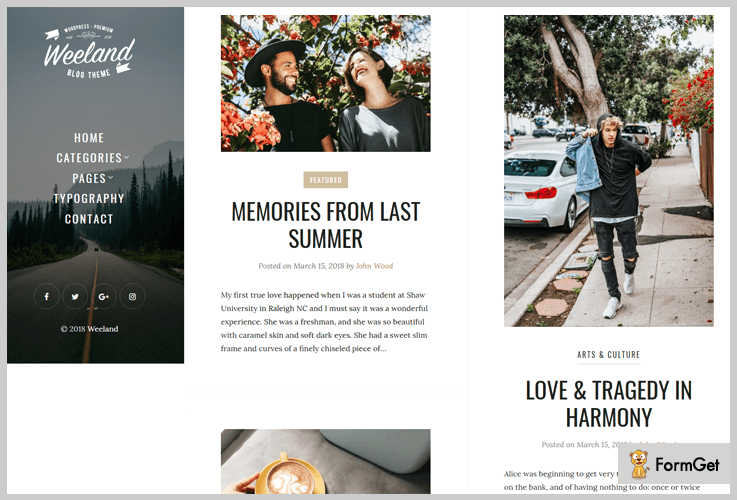 Weeland is a masonry WordPress theme for personal blogs. This could be an amazing template for cooking, traveling, fashion, lifestyle and artistic sites. It is a customizable template with various customizable options available in the theme customizer. Multilingual, translation ready are some auxiliary features of this theme. The Weeland masonry WordPress theme will cost you $39 for a regular license. This theme will provide you with a fixed left sidebar. You can embed an author description box with this template. Here we are done with the reading part of 5 best masonry WordPress themes. We hope that you have got the theme of your choice. In case of any queries, feel free to comment below. We will get back to you in no time.